The Cobra Café, established 15 years ago, is a modern lunch café during the day. 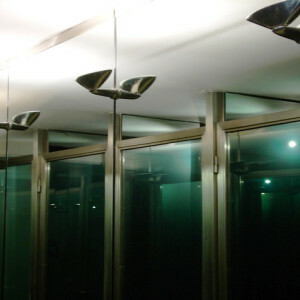 However, it can be reserved for evening functions to simply enjoy a few drinks or to hold dinners or parties. During the summer months, Cobra has access to 2 large full-service terraces where our guests can enjoy the beautiful surroundings. In the winter months, the pond is transformed into a skating rink, provided with lighting for evening enjoyment. Our café, with its winter terrace, is therefore the perfect place to keep an eye on the children whilst enjoying a glass of hot chocolate or glühwein. 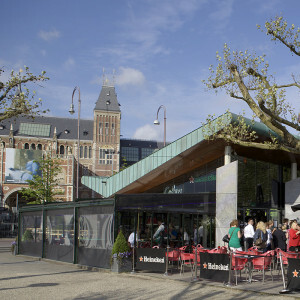 The toilets, situated on the lower floor immediately below the café are public toilets and are open to all visitors to the Museumplein. The toilets of Cobra Café has once won the price for finest toilet of the Benelux. All visitors to the toilets are required to pay 50 cents at the toilet entrance. However, Cobra Café guests receive 50-cent discount on their bill on presentation of their ticket. The toiletvouchers can also be used as a discount for the cobra museum in Amstelveen! The Cobra Shop is located next to the public toilets on the lower floor immediately below the café. 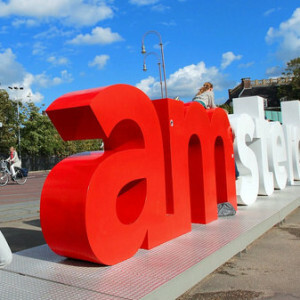 I Amsterdam, as well as entrance tickets for the must-see Heineken Experience! When you will buy the entrance tickets at Cobra Café you will receive a discount of € 2,- and you will be able to skip te line at the entrance.